I read this in The Guardian the other day. Cheered me up no end. 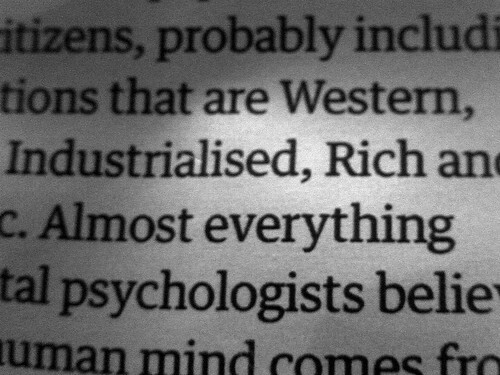 It's about WEIRDness, or how Western Educated, Industrialised, Rich and Democratic societies produce people who are in no way typical of the planet as a whole, yet make up the bulk of the respondents in social science experiments. "So, the first article is called "The Weirdest People in the World," by Joe Henrich, Steve Heine and Ara Norenzayan, and it was published last month in BBS. And the authors begin by noting that psychology as a discipline is an outlier in being the most American of all the scientific fields. Seventy percent of all citations in major psych journals refer to articles published by Americans. In chemistry, by contrast, the figure is just 37 percent. This is a serious problem, because psychology varies across cultures, and chemistry doesn't." As I embark on learning how, professionally, to talk to and work with people from other places it's cheering to know I don't know anything. Because if the real social sciences are biased towards Western intuitions then the pseudo-sciences of marketing are, planetarily, even more bogus than I'd always suspected.